The notion that language evolved only in the human lineage has long been attributed to the linguist, Noam Chomsky. He argued that mankind had a special “language organ” unique to us which did not exist in any other animal. This idea has been challenged over the years by a number of researchers who argue that other species are just as good at communication. Now data has been published which will no doubt give scientists more food for thought. A new study with a language-trained chimpanzee led by Lisa Heimbauer at Georgia State University in Atlanta, suggests that when it comes to understanding speech, the basic equipment might already have been present in our ape-like ancestors. The subject at the heart of this latest research is a 25-year-old chimpanzee, called Panzee. She was raised by people from the age of eight and fed a staple diet of the English language. 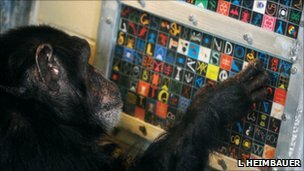 She still can’t speak but this great ape is able to communicates with those around her using a lexigram board of symbols corresponding to English words. She can also point to 128 different lexigrams when she hears the corresponding spoken word like: banana, balloon, tickle. Mankind is thought to be uniquely special because we have a common language by which we recognise words and understand sentences even if the sounds of the words have been dramatically altered. I remember having a friend at infant school, whose mother was deaf. When she spoke to us her speech was distorted, but it was still possible to understand what she was saying, even for a 6-year-old. Heimbauer and her team set out to see how well Panzee could duplicate this human ability of understanding English word sounds when they are distorted making them difficult to recognise. The team used two electronic methods to distort the words: noise-vocoded (NV) synthesis, which makes words sound very raspy and breathy; the other, known as sine-wave (SW) synthesis, which reduces words to just three tones, the equivalent to stripping down a colour photograph into a black and white version. Panzee is one of the few animals to be tested in this way and this was the first time she had heard these words in this form. She performed well above chance when she heard distorted versions of 48 words that she knew from a computer and had to choose among four lexigrams. Panzee scored 55 per cent with NV words and about 40 per cent with SW words, which are particularly difficult to understand even for humans. Researchers say this was almost as good as the performance of 32 people using the same 48 words, who chose the correct NV word 70 per cent of the time but, like Panzee, the correct SW word only 40 per cent of the time. 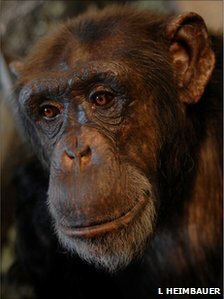 The scientists say that Panzee’s upbringing appears to have given her enough experience of hearing and understanding spoken words to allow her to recognise them when they are distorted; and say it argues against the idea that humans evolved highly attuned speech-recognition abilities only after they split from the chimp line some 5 million to 7 million years ago. Heimbauer said: “It highlights the importance of early experience in shaping speech perception. It also provides evidence that a common ancestor of humans and chimpanzees would have had the ability to perceive speech,” she says. “If humans do possess a specialised, cognitive, speech-processing brain module, it would be something that evolved later in humans, making us more efficient at what we do. Professor Trout added that the human volunteers had to pull matching words out of a vocabulary of about 30,000 words, whereas Panzee had a much smaller vocabulary to search through. But the authors argue that this study highlights the importance of experience in shaping speech perception. The findings by Heimbauer and colleagues has been published in the journal Current Biology. Posted in: would you believe?! ← East Africa’s worst drought – or is this the shape of things to come?